6am – Get up, walk dog, shower and drive to local Railway Station, unusual for me, but after the “fun” driving to Cardiff the last few times I thought time to try something else. Oh and the £40+ fee to park didn’t make the decision too difficult either, I mean come on 3 days or more costs same as a WEEK!?? Me: Wouldn’t it be great if there was some flexibility on the Pre-Arranged ticket I bought? Me: Half empty train just left here, wouldn’t it be great if the conductor had flexibility to take on any passengers waiting? FGW: Pre booked tickets are cheaper, for a specific train, and it is illegal to travel without a valid ticket! Me: I KNOW, THAT’s WHY I’ve BEEN SAT ON THE PLATFORM FOR 40 MINUTES! End of Tweet conversation, before steam coming out of my ears, contributed further to global warming! So MY train turned up, and a little while later I arrive at London, swipe my Oyster card, I feel like a Londoner as I’ve got an Oyster Card! Paddington to Tottenham Court Road, via Oxford Circus, 1 stop and I climb out into my favourite place in THE WORLD! 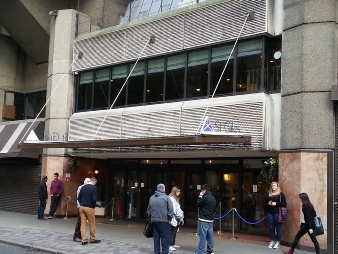 My hotel this time, a first for me, was the St. Giles Bedford Avenue, London WC1B. 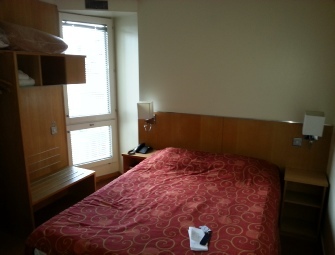 Well at £109 per night it was cheaper than both the Strand Palace and the Travelodge, so I thought why not give it a go. I knew a few people who had stayed there so it was not too much of a risk. I get there between 11:30 and 12:00, check in isn’t until 2pm. So I get to the desk, no queue, and a very helpful young lady checks me in, and (RESULT) gives me my key! So I head to my room, 213 on the second floor. 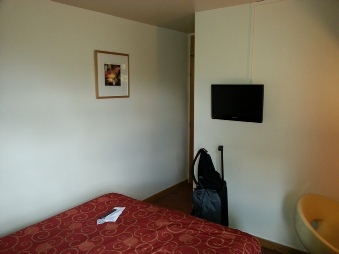 As you can see from the photos this was a compact but completely adequate room, clean, secure, with all usual amenities: on-suite bathroom, TV, Safe, Hair Dryer. So I drop off my bags, hang up some clothes and head straight back out. Passing on the way: vending machines on the floor for snacks, an Ironing room and a concierge desk, all in all a nice welcoming hotel, and one I will definitely use again. They also have, although I did not use this time, access to a Fitness centre including swimming pool, a restaurant, bar, conference facilities and what looks like a Computer Centre, although strangely no Wi-Fi I could find, although in their defence with such a short stay I didn’t ask. Oh I’m deliberately being vague as to what I’m seeing, thought I’d experiment with suspense in this review! So with the evening Performances booked I look for a matinee, and after checking Dirty Rotten Scoundrels, no day tickets, no discounts and limited availability of end of row seats, my personal preference. I head to Mama Mia, and although they also don’t do Day Tickets. Oh side bar here for those who don’t know what Day Tickets are, well if you go to the Box Office of the theatre on THE DAY, some have heavily discounted seats available. I am informed by the Box Office gent, from my home town, small world! That they have some “re-priced” tickets at £37.50 from £67.50 Sorted, so I head to the Moon under Water Leicester Square and partake of a Burger and a Pint, well, it is London and I am on “holiday”, be rude not to. On the way back to the theatre with time to kill I thought I would check on the David Bailey Stardust exhibition at the National portrait Gallery, as I had heard that it was a free exhibition, all the (big) posters say this in (big) writing, mind you when you get there, there is a small amendment … for Members! So not wanting the part with £16 for entry I head back to the Novello theatre and my matinee for the day. The weather man had said rain / heavy rain / thunder … I got, for the most part, glorious sunshine and really warm, so the ¾ length leather coat I was wearing may not have been the best choice! As I got to Mama Mia, in fact just as I got under the awning outside the Theatre the heavens opened, lucky or what. Now there can’t be many people who don’t know the story of this show, how it became a mega hit, spawned a (great) film… well I liked it! Basically it’s a love story woven around the songs of Swedish Super group ABBA. Including the songs: “Mama Mia”, “Money Money Money”, “Chiquitita”, “The Winner Takes it all”, amongst many others including my personal favourites: “Slipping through my fingers” and “Our Last Summer”. I was lucky to see the main cast, and so had the great pleasure of seeing the wonderful Diane Pilkington, who I last saw in Tonight’s the Night, she brought a vulnerability to the role as well as an exceptional voice. All the other parts were played with panache and skill. Now if you know me, have ever talked to me, have looked at any part of my site, or read any of my reviews you will know what I think about this show. It started me on my theatre odyssey, it is the show I’ve seen the most, 17 times and counting. I first saw it on the Wogan show on TV and fell immediately for the sublime Lea Salonga, then a 19 year old unknown (outside the Phillipines). Also the songs resonated with my unashamedly romantic outlook on life, and the power in those songs can bring Goosebumps now just typing about thinking of them . I have many memories linked to this show, going with my Mother on bus trips from Cardiff with City Centre Ticket Line, where you got a few hours site seeing and a ticket then a return trip home. 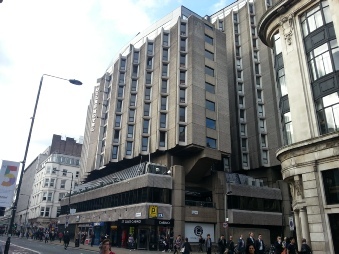 Which I loved all of … apart from the trip home … I always wanted to stay! This was, for my memory the only time he went to the theatre with me, by choice. As in not when I was being paid to film a show, not his cup of tea as a rule. Although he bought me many many tickets over the years, and put up with my reliving all the shows as soon as I’d seen them. So now having lost both parents this show has an even more personal connection for me, and some of the lyrics from my favourite song “I Still Believe” … “I still believe.. you will return … I know you will … my heart against all odds holds still..” are quite something to hear at the moment. So when I heard that the show was coming back, 25 years after its original premier and 15 since it closed at Drury Lane I knew I had to see it. I booked a ticket, paid for by my Dad, thanks Dad! For the first performance after the official opening night and so we get to now. I’m stood outside the theatre, with hundreds of other expectant fans and thinking of people who aren’t with me this time. This new production has “broken all box office records” and that isn’t a sales cliché in fact it sold more tickets on the first day of pre-sale than any show opening in London or on Broadway EVER! When a second batch of tickets were released the day after the official opening performance they sold £1,200,000.00 in a DAY! See I TOLD you Cameron you shouldn’t have closed it when you did think of all the money you could have made. 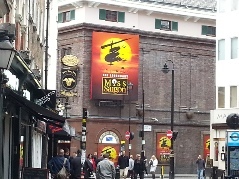 So to #MissSaigon25 as it’s called on twitter. This is a new version of the show, with a new cast, new orchestra, a new song for the character “Ellen”, oh and quite a lot of new lyrics in the original songs too. Which takes a little getting used to, and stopped my silent miming along to all the songs in its tracks, but I gotta say they were different, none were worse and some were even better! So it’s just gonna mean I gotta go and see it a few more times to listen to all the changes . The Cast, well I believe I saw, you can never be quite sure with announcements not always made or inserts put in programmes. But if memory/ eyesight serves I was lucky and saw the entire original cast. “Kim” Eva Noblezada, “The Engineer” Jon Jon Briones, “Chris” Alistair Brammer, “John” Hugh Maynard, “Ellen” Tamsin Carroll and “Thuy” Kwang-Ho Hong, special mention also to the brilliant Rachelle Ann Go as “Gigi” another discovery from the Philippines, and a true star of the future, check her out on YouTube to see what I mean. The cast were excellent. It was with some trepidation that I went, I mean could they match Lea, Jonathan Pryce, Peter Polycarpou and the others who were “my” characters. Well, thankfully yes, they were different, yes, well it has been 25 years, but with the exception of Alistair Brammer (who was very good) the others were faultless. When you think that Eva was a school girl, literally, never been on a professional stage before, WOW just WOW! She had the vulnerability and what a ‘set of pipes’ as they say, she really wrung every drop of emotion out of her songs, and you heart broke for her with the trials “Kim” goes through. Jon Jon who I had the pleasure of seeing in the role previously, as he played it in the original production, masterfully owned the stage, and you couldn’t take your eyes off him, all the little “bits of business” he added really made the role his own. Hugh Maynard, had a tough job, as I’d heard one “John” do “Bui Doi“ as a gospel number and HATED IT! So I am very ’precious’ about the song being done as it was written, however he made it his own without betraying the meaning and power of the original. Now I almost never give negative reviews of performers and I will say this isn’t negative as such, it was just that … when I saw him Alistair Brammer didn’t quite bond as “Chris” for me, he had a few vocal problems in parts of some of the songs, now this could have been fatigue, nerves or just an off night, but he didn’t quite … connect with “Kim” in the way that I had seen some others performers do. Still a strong professional performance, you would expect nothing less from a performer on a West End stage, and other reviewers have commented on how great he was, so as i said maybe an off night, but sorry for me not quite as exceptional as the others. All in all the show was brilliant, the staging every bit as effective and spectacular as the original, dare I say it the helicopter was if anything MORE effectively done. Although it is a smaller stage, what isn’t. 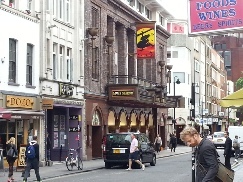 If memory serves Drury Lane is the biggest stage “space” in London. Some of the changes were an improvement, for example “Kim’s” room being ‘across the street’ and overlooking Dreamland was a brilliant change, especially for “Why God Why”. Stand out numbers for me as always were: “Why God Why”, “I Still Believe” (my personal favourite), “The Movie in my Mind”, “I’d Give my Life for You” and “Kim’s Nightmare”, the new song “Maybe” was very nice and I think will grow to be another favourite when I’ve heard it a few times more. Will I be back? Of course I will, it’s MY show, it will always will be. I have so many memories invested in that show: meeting a lovely lady called Amy who was a dresser in the original show and who gave me one of my most prized possessions a poster signed by all the cast. 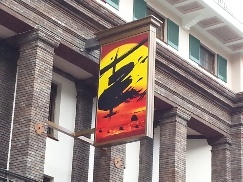 I have a framed “You’ll Miss Saigon” poster that was never released to the public; only used for advertising on the Tube and for official Ticket Agencies. I got it by going to a booking agency Albermarle on the day after the final performance and they kindly gave me theirs, I have Programmes, one from every time I’ve seen it, brochures, I’ve even “got the t-shirt” 2 in fact! So well you’re thinking 1 day two shows not too shabby, well we’re not finished yet dear reader, back to the hotel drop off my programme, and it’s to the Dominion theatre, now the more observant amongst you may be thinking … it’s gone 11pm he must be breaking in. Well no, for one night only there is another show there. Starting at 11:30pm you have the West End Eurovision, which is a charity show to raise funds for the MAD (Make a Difference) charity which supports people with HIV and AIDS. 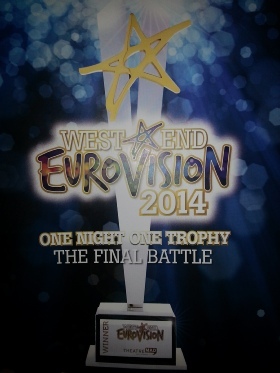 Basically the casts of different West End Shows sing Eurovision songs, camp or WHAT! With celebrity judges: Graham Norton, Caroline Quentin, Rylan and Lesley Joseph. This year, regrettably the last, it was for the first time a TIE! So you had Mama Mia and Les Miserables winning, this was decided by a combination of votes from the celeb judges, selected members of the casts of the shows (they couldn’t vote for their show), text votes for the short video idents (1-2 minute films produced by the cast and posted on YouTube) and text votes from the audience on the night. This was the nearest I’d come recently to the much missed West End Cares (a forerunner of MAD) cabarets that used to run in the 90’s. Which I loved and saw as many as I could. So at 3am I head back to my hotel and crash for a few hours before catching a train back to Wales. So there you have it, a different trip, a different review, not so many funnies, but this is the first of these I’ve done since I lost my Dad and things are different now. Not to say I don’t laugh, if he taught me one thing it was “don’t let the b*stards grind you down” no matter how they try. So I’ll be back, I’ll continue watching shows, I’ll continue seeing the same show twice in a day, I’ll continue seeing the same show over and over again, (guess which one!) As I LOVE IT, theatre is a distraction, an addiction, a blessing and more than anything a wonder.